Manufacturer: Victorinox Swiss Army Brands Inc. 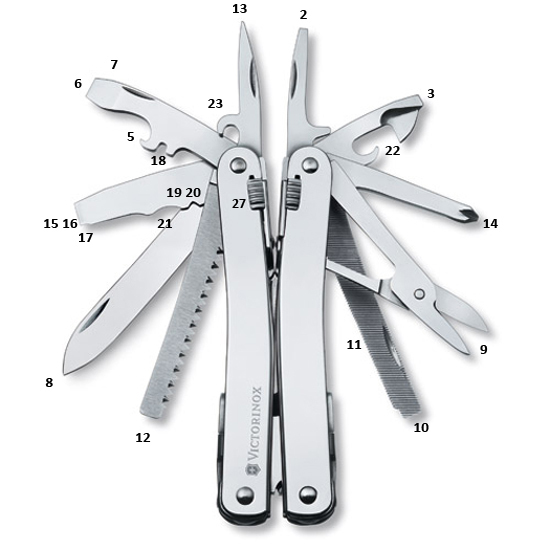 The Victorinox Swiss Army SwissTool Spirit X multi-tool (hereafter called the Spirit X or the tool) is a very beefy tool. While it looks to be constructed almost entirely of stainless steel a magnet readily sticks to it so it must just be very nicely polished carbon steel. 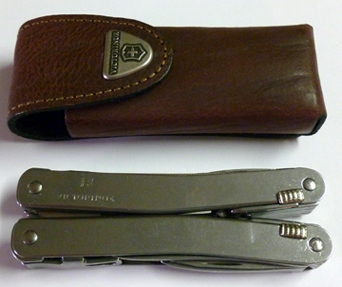 The handles have the Victorinox name shield logo stamped into them on each side. Otherwise they are bare and very smooth. Packed inside the handles of the Spirit are a whopping 27 tools which are all on display in the picture below. They consist of the following, numerical and identified (by me) on the picture courtesy of Victorinox. Every tool will lock in place once it is taken out of the handle. It is released by sliding the knurled grips (27) at the top of the handles downward. The pliers snap into place firmly and are pretty much full size at 6.3 in (16 cm) long when in play. The Spirit X comes with a nice leather sheath. I am not much of a sheath guy but who knows? Maybe I will strap it on to strut my stuff in the back country. Then again maybe not. Want to know for sure? Well then come back in two months to read the Field Report of the Spirit X's first 60 days of real world use, at which time I shall discuss the individual tools I was able to actually use. The Spirit X has done everything I expect a multi-tool to do to date. It has proven useful in the field and in hotel rooms after backpacking. My only complaint so far is that the highly polished finish is hard to grip when wearing gloves. Please read on to see how it has worked for me. I have used the Spirit X on eight backpacking and camping trips over the past three months. First I took it to Washington and Oregon for a three-day backpacking trip on the Pacific Crest Trail. This up-and-down trip saw temps average 40 F (4 C) with rain on two days, and even sleet on one cold windy Washington ridge. 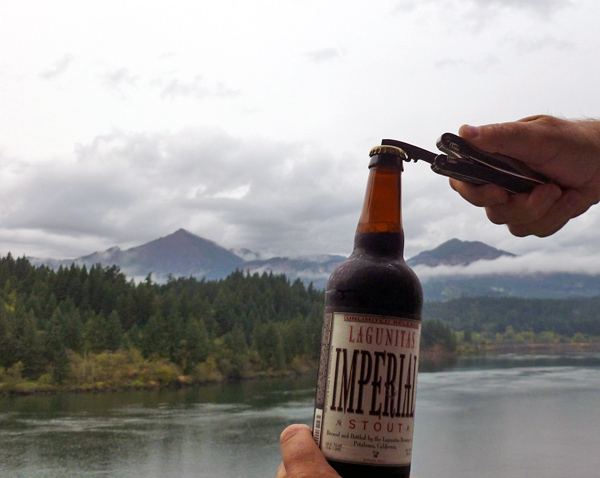 The picture above was taken on the rainy bank of the Columbia River, opening the celebratory post-hike ale. The bottle opener works quite well, thank you. The rest of the backpacking took place on or around the North Country Trail (NCT) in Chippewa National Forest and Paul Bunyan State Forest. Camping trips were in those forests too plus trips to Buffalo River State Park and primitive canoe sites on the Red River of the North. The low temperatures ranged from 45 to -1 F (7 to -18 C). Many of the trips saw rain; one trip had a night of sleet, and there was a little bit of snow on one. Even though I normally don't carry a big multi-tool for 3-season hiking, the past few months saw the Spirit X accompany me on 18 days of hiking and camping. The knife blade has been the option most used so far. 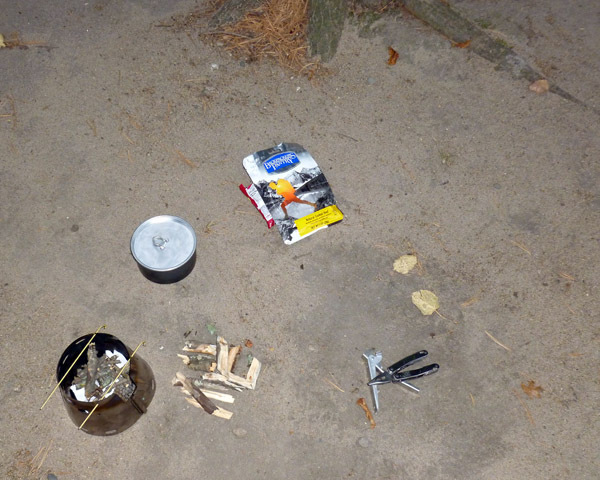 On the early fall hikes I was using found fuel (down wood, dead branches, etc) with a wood-burning Caldera Cone system and used the blade to shave fire starters. (Little twigs with shavings cut just enough to peel away from the center, but left attached to make a fuzzy stick, if you will.) The blade is nice and sharp and is not noticeably dulled yet. I did get some pine sap on it once but a little hand sanitizer took it off no problem. I have used the scissors a few times to cut moleskin into donut shapes for blister control. They work better than my normal little first-aid scissors. A couple trips saw me use the screwdrivers, once to tighten a loose headlamp, and once to help a fellow camper open a bottle of wine when they found they had no corkscrew. By screwing a Philips-head screw into the cork I was then able to use the pliers to pull the cork and screw back out, bringing joy to my neighbors. Those pliers have been very useful the entire time too. One backpacking trip saw me get into a bunch a burdock while setting up my tent. I had the burrs in my socks and fleece gloves. As they are covered in spines all around the pliers were the safest way to pull them off. They even saved the day once. On the 3-day backpacking trip on the NCT I set-up the first night to find that a last minute tent change meant that I left the titanium hook stakes that I also use for my Caldera system at home. The stakes I had would not work so I had to forgo hot dinner. I had enough food bars and such to make it one night but not two so decided to push hard and fast to complete the trip in two days. I stopped to get a burger and told the friendly server about my cooking tribulations. She asked if I needed some tools to fix my "stove" and I asked if they by any chance had a wire coat hanger I could have, which she did. 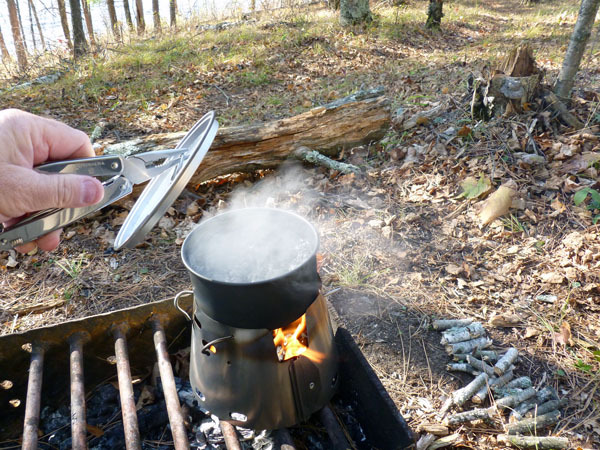 Since I was a long way from home and had planned to be in camp another night (and had two dinners to cook still) I headed to a remote camp spot I knew of to spend the night and used the Spirit X to cut the coat hanger into the correct size pieces to make my cooking system usable. It worked great and I had a hot dinner that night. Here is a shot after getting the Sidewinder ready to cook with. Another use for the pliers necessitated by the wood burning system is as a lid lifter. The pot I have to use has a handle that lays flat and it gets quite hot. The pliers make it painless to take off. Lastly they have been quite helpful for pulling stakes from the ground after they have frozen in overnight. I thought that the multi-purpose hook (#23) would work well for this but the reamer (# 13) gets in the way. If I have any complaints about the Spirit X it would only be the highly polished finish is very hard to grip when wearing fleece gloves or (more often) knit glove liners. They want to slip right out of my hand. Taking the gloves off when it is near 0 F (-18 C) is not an option as any moisture on my hand will result in skin frozen to the Spirit's handle. A rougher surface on the flat of the handles would be nice. That's it so far. We finally got some measurable snow so maybe I will be out with the kind of gear that sees me needing a multi-tool more during the Long Term phase of the test. Please come back in a couple months to see how the Spirit X does. I will leave with a shot of it lifting a lid on the shore of Waboose Lake on the NCT. During this phase of testing I was only able to get out twice. The first was an overnighter at a primitive canoeist's campsite on the Red River of the North near Hendrum, Minnesota. It was cold and very windy with a storm on its way. Temps ranged from 15 down to -5 F (-9 to -21 C). Next I spent three days near the border of Canada at Bronson Lake State Park outside the aptly named town of Bronson Lake. I spent one night on the banks of the South Fork Two Rivers and the next on the shores of--you guessed it, Bronson Lake. ;-) This sled-packing trip saw scattered light snow and temps ranging from 20 to -2 F (-7 to -19 C). The winter has continued to be a very strange one. We have still received only a fraction of our normal snowfall. The trip to Bronson State Park saw me able to use my gear sled for the first time and there still was not enough to need snowshoes or use skis. So the only real use I got out of the multitude of tools on the Spirit X was using the knife to cut the top down on my freeze-dried meals to make them easier to eat from. I kept the Spirit X in the tool pocket of my gear sled and forgot to take it out to warm in my pocket before getting the knife blade out. As I can't open the knife with gloves on it made for a shockingly cold few seconds as the knife was probably around 5 F (-15 C) when I used it. The next day I kept it in my fleece jacket's inner chest pocket. Other than that I really can't add much. I do like it enough to keep it as my winter multi-tool and it will be going with me on an 8-day trip (5 hiking) in a couple of weeks. But as the test is over I won't be back to talk about it here. Thank you for reading my report and thanks to Victorinox Swiss Army and BackpackGearTest.org for letting me have fun trying to find 27 things to do with the Spirit X.